Here are three of the pieces I was experimenting with at the beginning of February – I’ve been working on them on and off, coat after coat of paint and then varnish, and now they’re sitting on my desk waiting to go to their new owners. They’re all prototypes – I’m happy with the look of each of them, but there are lessons to be learned from them all too. Pendant, 45x65mm, weighs 21g. Ultramarine swirled panel in an epoxy setting, with an antiqued bronze finish. 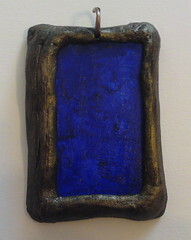 One of the advantages of using two-part epoxy over polymer clay is that it cures at room temperature, rather than having to be heated in the oven, so I can use acrylic paints and (as here) inset rectangles of artist’s mountboard, without worrying about what that sort of heat will do to it. Next time I do one of these, I’ll drill a larger hole (or two holes) to loop cord through directly, rather than trying to bend a jump ring threaded through that thickness of solid material. 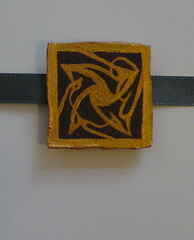 Brown & gold choker slide, 35mm square, weighs 8g. Sits a bit lower on the ribbon than it does in the picture – next time, I’ll centre the slide on the back a bit more. I actually made three others using the same paper, but didn’t clean the work area quite thoroughly enough and got flecks of epoxy on the front surface. So that’s another area to be careful with. Aventurine & bronze choker slide, 20x30mm, weighs around 12g. 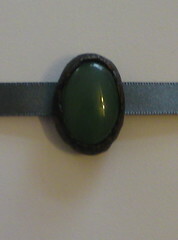 Aventurine cabochon stone in an epoxy setting, with an antiqued bronze finish. I need to be a bit more careful about moulding the epoxy around the slide – this one ended up weighing a bit more than it had to, and I had to clear the slide holes with a scalpel after it had finished curing.